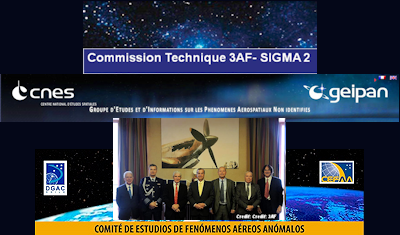 3AF is an important organization in France, and in Europe’s aeronautical industry in general. Similar to the United State’s American Institute of Aeronautics and Astronautics, it is a society for those participating in, or interested in, the aerospace industry. Surprisingly, 3AF also has a strong interest in the investigation of UFOs. Although, it might not be too surprising to those who know that the French government is one of very few that have an official organization that investigates UFOs. It is called the Study and Information Group on Aerospace Unidentified Phenomena (GEIPAN), and is part of France’s National Center for Space Studies (CNES), their version of NASA. CEFAA, which is also an official government sanctioned UFO research organization, differs from GEIPAN in that it is part of Chile’s Directorate General of Civil Aviation (DGAC), the equivalent to the FAA here in the U.S.
3AF also has a UFO study commission called 3AF/SIGMA2. This commission aides GEIPAN in the scientific analysis of UFO reports, and they will now help CEFAA in a similar fashion. 3AF’s article explains that CEFAA has determined that the UFO phenomena is real, and that it may pose a risk to aviation. Now they wish to further examine “their causes and their effects.” . . .